We’ve told you time and time again that you need to turn off your phone before going to bed. But, as it turns out, those nighttime hours could be prime time for sending out some highly engaging tweets. 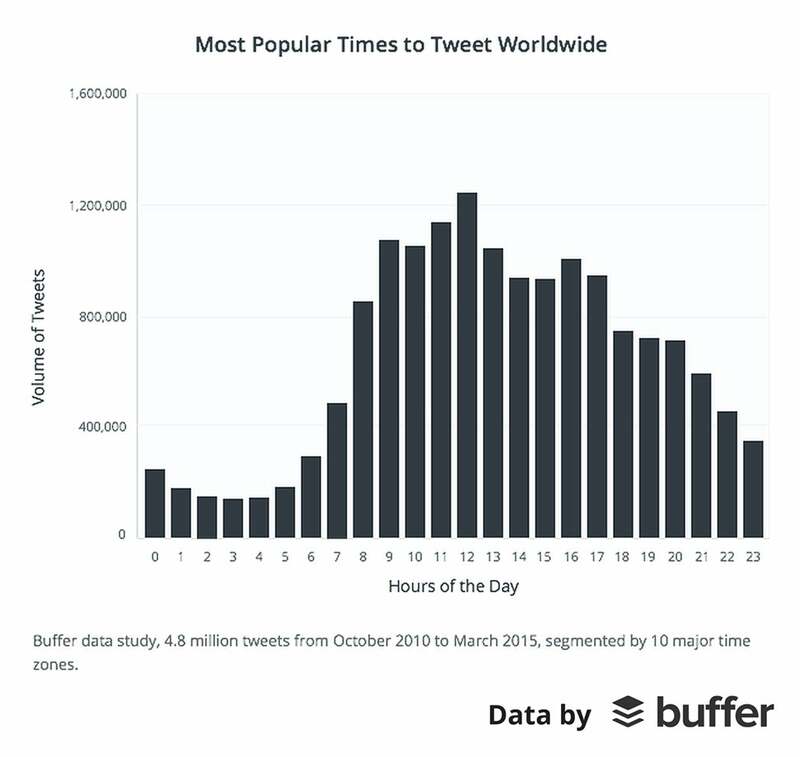 Buffer, a scheduling and analytics app for the major social platforms, analyzed all of the tweets that have been sent through their service since October 2010. That gave them 4.8 million tweets to work with. Here’s what they found. If clicks are your goal, try sending out tweets with links between 2 a.m. and 3 a.m. On average, these tweets earn the most clicks. The fewest clicks per tweet take place between 9 a.m. and 1 p.m. If you’re looking for engagement (Buffer defines engagement as clicks, retweets, favorites and replies), night owls win again. The highest amount of engagement per tweet occurs between 11 p.m. and 5 a.m., peaking between 2 a.m. and 3 a.m. Tweet when fewer people are tweeting to increase your chances of being noticed. In many cases, 70 to 80 percent of total engagement comes from clicks, says Kevan Lee of Buffer. Best time for clicks worldwide. 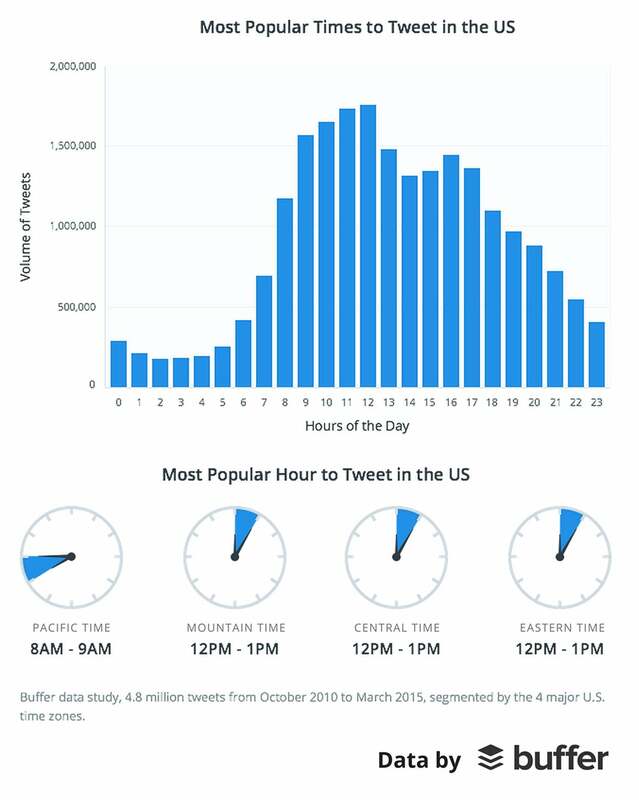 For those with worldwide audiences, here’s a breakdown of the best time to tweet for clicks in 10 major time zones. Adjust your tweets accordingly. Los Angeles, San Francisco, etc. (Pacific Time): 2 a.m.
Denver (Mountain Time): 7 p.m.
Chicago (Central Time): 2 a.m.
New York, Boston, Atlanta, Miami, etc. (Eastern Time): 11 p.m.
Madrid, Rome, Paris, Berlin, etc. (Central European): 7 p.m.
Cape Town, Cairo, Istanbul, etc. (Eastern European): 2 a.m.
Sydney (Australian Eastern): 2 a.m.
Hong Kong (Hong Kong Time): 5 a.m.
Tokyo (Japan Time): 8 a.m. Whether you’re looking for clicks or conversation, now you’re armed with the best times to tweet.